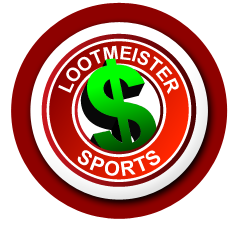 Welcome to the Lootmeister online sportsbooks page! Here you'll find reviews of the best betting sites on the net that offer you the ability to place a bet on a sporting event. These bookies offer (but are not limited to) football betting, baseball betting, basketball gambling, hockey wagering as well as the ability to gamble on horse racing action, UFC fights, NASCAR races, PGA golf, boxing and more! You can even bet on reality TV shows and political events at most books! Lastly, almost all offer online casinos and some even offer live Texas Hold'em where you can play against other people. Standard sports bets consist of straight wagers (sides), totals (over/unders), parlays and teasers. Almost all online sportsbooks also offer prop bets, moneylines, round robins, pleasers, first half bets, haltime wagers and more. Some even offer live betting where you can place bets after the event has started! Lastly, some offer competitive pricing where you get to bet at discounted odds, which saves you big money! (See below). We've been in the offshore sportsbook industry since 1998. We know which books are safe to play with and where you won't get hassled when you request a payout. We only list the cream of the crop here... When you're playing with a Lootmeister recommended betting site, you're playing with a sportsbook that is ROCK solid! We're hear to help you! Drop us a line if you're looking for something in particular or need help finding an online betting site to suit your needs. Bovada - One of the biggest sports gambling sites on the web and one of few online sportsbooks where you can play live Texas Hold'em against other real players all from the same account! Bovada is one of the best at getting credit cards to work for depositing and offers you an aggressive 50% sign-up bonus up to $250 in free bonus cash. Another thing that you'll like about this bookie is their opinionated lines. Most sportsbooks offer the same point spreads and totals. Not these guys! You'll often times find football and basketball spreads that range 1-2 points different than other betting outlets. They've been around since the industry started and are rock solid. GTBets - Fatten your bankroll before even placing your first wager with their 100% deposit bonus where they'll match you dollar for dollar up to $500! If that wasn't enough to grab your attention, they also offer one of the coolest betting promotions on the web with their free point offerings. When you sign up, you get to select your two favorite NFL teams and two favorite NCAA football teams. Every time you bet these teams, you get a free half point on the NFL bets and a free full point on the college teams! GTBets also offers a loyalty program to reward their clients for staying faithful to them and offers some of the fastest payouts in the online sportsbook industry! Highly recommended! BetOnline - Home of the GIGANTIC bonus! This site offers 50% in free play money up to $2500! No deposit hassles here! Your credit card will work! Huge menu of wager options and a nice rewards program as well! This is a "must have" sportsbook in your betting arsenal if you wager on baseball as they offer dimelines up to -199. Offers live betting on games in progress as well! Sportbet - While we're not a huge fan of playing parlays, most bettors can't resist the huge payouts they offer. If you're going to bet them, you better be doing so at this site as they offer the absolute best parlay odds on the internet. Once you compare them and see how much more you'll be receiving on your winning bets, you'll be kicking yourself for ever playing anywhere else. As with all of the online bookies we promote, Sportbet has been in business for a long time and are rock solid as they're under the 5Dimes umbrella.